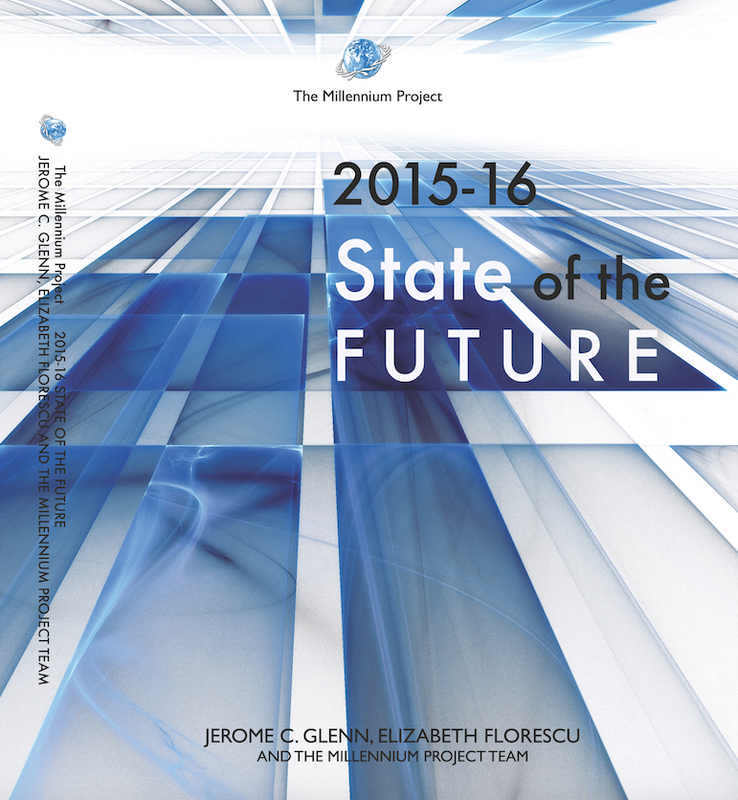 The Millennium Project released today its annual “2015-16 State of the Future” report, listing global trends on 28 indicators of progress and regress, new insights into 15 Global Challenges, and impacts of artificial intelligence, synthetic biology, nanotechnology and other advanced technologies on employment over the next 35 years. This “World Report Card” may have “more data, information, intelligence, and wisdom about the future of the world than has ever been assembled in one report,” says Jerome Glenn, CEO of The Millennium Project and lead author of the report. The 300-page report distills research from UN organizations, national governments, think tanks, and thought leaders around the world, with more than 50 charts and graphs. A free 14-page executive summary is available in English and five other languages. The concept of work will change over the next generation or two, but global thought leaders are divided about the best policies to make a smooth transition. By 2050, new systems for food, water, energy, education, health, economics, and global governance will be needed to prevent massive, complex human and environmental disasters. Environmental security should be the focus of joint goals to build strategic trust between the U.S. and China. General human welfare has improved, but at the expense of the environment and with worsening intrastate violence, terrorism, corruption, organized crime, and economic inequality. The Millennium Project is a global participatory think tank connecting 56 Nodes around the world that identify important long-range challenges and strategies and initiate and conduct foresight studies, workshops, symposiums, and advanced training. Its mission is to improve thinking about the future and make it available through a variety of media for feedback to accumulate wisdom about the future for better decisions today. In addition to the annual “State of the Future” reports, the Millennium Project produces thew “Futures Research Methodology” series, the Global Futures Intelligence System (GFIS), and special studies. More than 4,500 futurists, scholars, business planners, and policy makers who work for international organizations, governments, corporations, NGOs, and universities have participated in The Millennium Project’s research since its inception in 1992.